At the age of 30 suddenly his life fell apart.3 years since the diagnosis, a strategic planner from a global advertising agency who can now only move his left index finger and his face, expresses his thoughts and emotions on life before and after ALS…and about his hope.In the U.S. alone, approximately 5,600 people are diagnosed with ALS (Amyotrophic Lateral Sclerosis, also known as Lou Gehrig's disease or MND) a year. Told through a series of short anecdotes and remembrances, author Masahiro "Hiro" Fujita (b. Nov. 30, 1979) recounts his life story, which spans Tokyo, New Jersey, Zurich and London, from birth through the present. In what Fujita describes as more of a diary as opposed to a book, he lets the reader behind the curtain, sharing moments he has had with family, friends, colleagues and acquaintances, both before and after his diagnosis with ALS in November 2010. 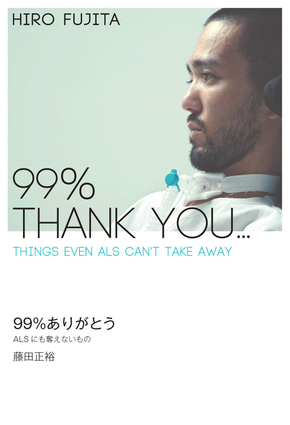 All of these stories, told with frank honesty and, at times, heart-wrenching emotion, have shaped the way he views life, as well as the way he battles this terminal disease.Written with the use of his eyes using an eye-tracking system, Fujita guides the reader towards a better understanding of ALS and shows them his unwavering vision for a cure. Masahiro "HIRO" Fujita was born on November 30, 1979. His childhood was mostly spent outside of Japan as his father's work brought him to countries such as the U.S., Switzerland, and the U.K. When his family moved back to Japan, he entered a national junior high school and then proceeded to American school for high school. After graduating from a university in Hawaii, he stayed to work at the Sheraton Waikiki Hotel. He moved back to Japan in 2004 and joined the Tokyo office of a global advertising agency, McCann Erickson. He had been building a successful and promising career as a planning director when he was diagnosed with the life-threatening disease ALS/MND (Motor Neuron Disease) in November 2010. Regardless of losing his voice due to getting a tracheostomy in January 2013 and the limitations posed by this condition, he continues to go to work once a week and spends the rest working from home. In addition, he has launched an advocacy group, The END ALS Association to help find a cure, and change policy that will help patients gain access to better means of communication. He actively speaks out and spreads his message through his blog and other media.